Megaflow are renowned for quality unvented hot water cylinders and are manufactured by a company called Heatrae Sadia. Heatrae Sadia are the UK's leading manufacturer of hot water systems with their flagship brand ‘Megaflow‘ leading the way in unvented hot water cylinders. Megaflow are not the only brand (if perhaps the most well known) of unvented hot water cylinders we also install, maintain and service other cylinder makes such as Ariston and Ozo. The above features describe MegaFlow's new range of HE cylinders which use a ‘coil in coil’ heat exchanger to deliver more hot water quicker than previous models. Please also note that older models may differ in specification, always consult your manual. The installation of an unvented hot water system must comply with both the Water Regulations and the Building Regulations. You must also notify your local Building Control Office, who will want to ascertain who will be installing the system. The system must be installed by a competent person, in other words someone who is qualified for the installation of unvented hot water cylinders. In the UK this means training and assessment by a recognised training body with cards being issued by organisations such as the Institute of Plumbing (IoP) or the Construction Industry Training Board (CITB). This qualification is not part of Gas Safe and so please make sure that if someone is installing an unvented system they hold the relevant qualification - we hold a CITB card and so are qualified to install, service and maintain your unvented hot water system. This picture shows an indirect mains fed hot water cylinder. 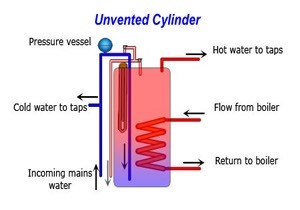 Water is heated by an primary heat exchanger within the vessel supplied by your boiler. On this example there is also a provision for a immersion heater as back up. Special measures are necessary to accommodate expansion as the high pressure water heats up, to ensure there is no dangerous build-up of pressure within the unvented storage vessel, and to discharge hot water safely away from the unit if necessary. If the vessel fails, an expansion release valve protects the system by releasing water via the discharge pipe. A normal thermostat maintains the temperature of the water below 65°C. A second thermostat switches off the immersion heater and shuts off water from the boiler should the main thermostat fail and the temperature reaches 90°C. If both thermostats fail, and the water reaches 95°C, a temperature release valve discharges all water to the outside.